You will have many opportunities to worry today. Some things you worry about all the time. Some things you can’t anticipate until they are upon you. Either way,you can collect worry like it’s your hobby or you can choose peace. You have peace with God through Jesus Christ and because of that you can receive peace from God in every situation. Thay doesn’t mean the day before you isn’t full of challenges, it means that you have already decided to face them with the peace of God ruling your heart rather than the anxiety of man. 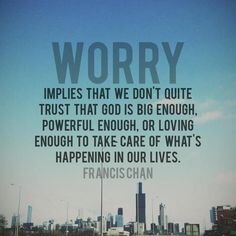 Recognize that out of all the decisions you will make today, the most important one will be what you choose to hold onto: God’s peace or your worry? Lord Jesus, let Your peace reign in all things. Amen. I’ve found that the One I trust is my only peace . Otherwise I get unsure of what direction my day should go, and if my understanding is correct. We are all off much more than we know. Yet, He makes the difference.